Real-life flight attendant Heather Poole has written a charming and funny insider’s account of life and work in the not-always-friendly skies. Cruising Attitude is a Coffee, Tea, or Me? for the 21st century, as the author parlays her fifteen years of flight experience into a delightful account of crazy airline passengers and crew drama, of overcrowded crashpads in “Crew Gardens” Queens and finding love at 35,000 feet. The popular author of “Galley Gossip,” a weekly column for AOL’s award-winning travel website Gadling.com, Poole not only shares great stories, but also explains the ins and outs of flying, as seen from the flight attendant’s jump seat. 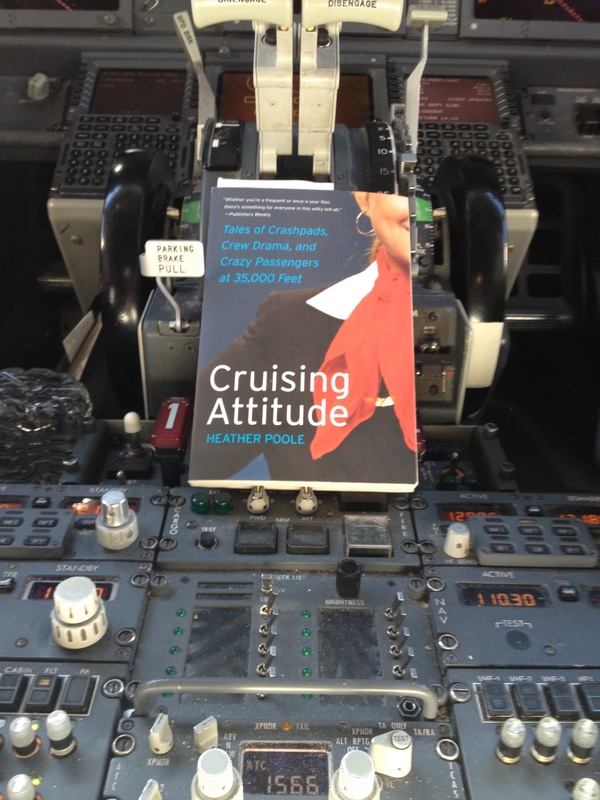 Much more goes into being a flight attendant than most people think and Poole, a flight attendant and popular blogger, gives readers the hilarious nitty-gritty details of a life spent in the sky. Starting out at the now defunct charter airline Sun Jet after college, Poole never considered being a flight attendant as a career option. But at her mother’s urging, she applied to a major airline, was hired, and has worked steadily ever since, surviving the rigorous training camp run with military precision (one false step could send you packing) and soon found herself at her first cabin service. Equally fascinating are Poole’s tales of what happens in the hours between flights, particularly in the cramped apartments known as “crash pads” that are more akin to dormitories than real living spaces, where the houses’ rosters are constantly in flux. Based out of New York, Poole describes a series of hilariously unappealing “pads” in Queens—chosen because of its proximity to JFK, LaGuardia, and Newark airports—and her fellow flight attendants, not to mention their often unscrupulous landlords. The snapshots of testy—or downright bizarre—travelers’ exploits ring particularly true because Poole doesn’t inundate the reader with so many that they all blur together. Whether you’re a frequent or once-a-year flier, there’s something for everyone in this witty tell-all. I retired from a major airline in 2000, after 20 years of service. I loved and hated the job. Your book, Cruising Attitude, hit the nail on the head. I thoroughly enjoyed reading it. Every Flight Attendant should carry this book and give it to the irate passengers on their planes. What an eye opener it would be for them. I intend to tell all my old F/A friends that they need to read this. Thanks for the laughs!! I also am a former flight attendant. I flew from the 70s to the early 90’s for the late great TWA. I loved flying and yes; once an F/A ALWAYS an F/A! Hi Heather I noticed a pic of myself with your name and book title on it. Im the redhead from us airways. didnt know I was getting my pic taken saw it on facebook.!?! please in box me havent read your box yet. Thank you! I don’t know which picture you’re talking about? Is it posted on my website? Hi Heather, enjoyed reading your book. When is the next book coming. Did we fly together? I’m thinking we did. I’m thinking I know this David. Just tell me if you have plans to forge my signature at certain bookstores in local malls? i am a F/A and I am looking forward to reading your book! The reviews are great! I just finished your book, Cruising Attitude. Great read – enjoyed reading it. I downloaded it just before my flight, and only read it through Kindle while onboard planes flying across country and back recently (two trips, Delta last month and US Airways through yesterday). I watched passenger interactions as I read, noting how poorly passengers behaved towards the flight attendants and fellow passengers. I sat with a flight attendant from Delta and discussed the book. He hadn’t read it, but confirmed the interactions. He was going to buy and read it based on our conversation. It gave me a much better appreciation for the flight staff. I watched a business class passenger get confrontational with a first class attendant on my second flight yesterday because he wanted to use the first class bathroom, and she explained for safety reasons he couldn’t. The flight attendant last night on US Airways, a middle aged man, made me laugh. He had a great sense of humor and approach to dealing with passengers. He seemed to enjoy his job. Thanks for the diversion from my day job. Sequel?